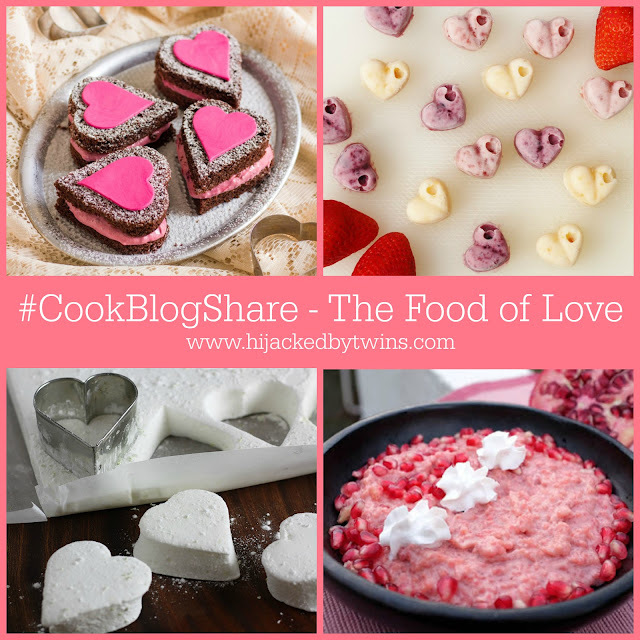 Hello and welcome to week 7 of #CookBlogShare. Last week the linky was hosted by Eb at Easy Peasy Foodie. For me last week was a wipe out hence me being quieter than usual. The dreaded cold bug returned and returned with a vengeance. Thankfully I am back on the mend and raring to go. As today is the day of love, Valentine's day, my round-up is all about the food of love. Valentine's and romance was felt in many posts that were shared last week so I had plenty to choose from. As always the hard part was narrowing it down to just four recipes. The four recipes that I have chosen are a delicious selection of sweet treats that will keep you wanting more. Happy Foods shared with us these irresistible Mini Chocolate Cake Hearts which would certainly win my heart over. These lovely little chocolate cake hearts are made with no ordinary chocolate cake, they are actually red wine chocolate cake hearts and with a berry and mascarpone filling. These are a must make! As soon as I saw the following recipe from Searching for Spice I knew that it was one that I would have to make. These Frozen Yoghurt Hearts will make a healthy treat and one that can be enjoyed guilt free, which for me is perfect. For anyone that knows me it will be no surprise that I chose the following recipe from Recipes Made Easy. These decadent little Gin and Tonic Marshmallows had me with the first ingredient, gin! Marshmallows are something that I have been wanting to make for a while and now I have this recipe I think it is time to try! The fourth recipe may surprise you, it certainly did me but it looks so good I had to feature it. Allotment 2 Kitchen shared this vibrant Creamy Beet Rose Rice Pudding. Yes this rice pudding contains delicious beetroot and topped with pomegranate you just know that this is a pudding which will leave you wanting more! Like I said before I struggled to narrow it down. Thankfully Nico from Yumsome shared a lovely, healthy round-up of 25 Fantastic Plant Based Recipes which will definitely give you a lot of inspiration! 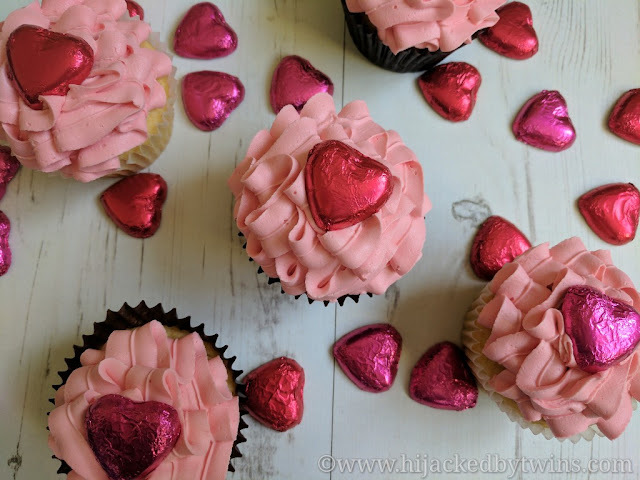 Then finally are my Valentine's Cupcakes which the hubby and kids demolished and have put in a request for me to make some more ready for Valentine's dinner! Now onto this weeks linky. As always there are a few rules that I ask you to follow. They are that you comment on either this post or the post labelled HOST, display the #CookBlogShare badge below, share the blog love and comment on some other posts that have been shared. I will be Tweeting, Pinning, Stumbling and commenting on all posts linked up. I look forward to seeing what you have been cooking. I will be back next week and will feature my favourite recipes as well as the linky! Oooh such pretty Valentine's recipes! How did I miss those marshmallows?! Off for a nose now! Lovely round up! I am hoping to fit in some last minute Valentine's baking with the children this afternoon and love the look of those mini chocolate heart cakes - I might have to leave out the red wine though! I hope you don't mind me linking up an old post this week but I've just remade it and updated the pictures. Great round up Kirsty - it definitely had to be packed with pink and pretty heart shaped recipes given what day it is. Hello Kirsty,Nice collection of Valentine's day recipes. I have also added my valentine's day recipe. Thanks for hosting dear and enjoy the day. Pretty Valentine's ideas. I did my Valentine's baking last week but my husband ate the lot! Happy Valentines to you. Thank you so so much for featuring my Beetroot Rice Pudding, I was really surprised and happy, thank you. Got another red heart popping recipe for you for this week too. Hope you like. What beautiful recipes you chose!! Those are super pretty cupcakes! Hi, Glad to be connected to you. This is my first time linking to this party. Syn Free, Gluten Free Pancakes!